Read the story in The Chronicle of Mt. Juliet! A 2014 graduate of McGavock Comprehensive High School, Brooke Williamson, was awarded the inaugural Servant Leader Scholarship. 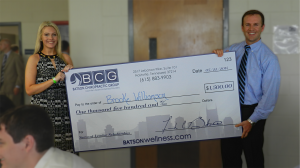 Brooke was surprised when Dr. Frank Batson, owner of Batson Chiropractic Group, presented the award on May 22, 2014 in front of her classmates at the senior breakfast. Brooke Williamson was chosen to receive the $1,500 scholarship because of her service to the school and to her community, including participation in the Health Occupation Students of America, Student Council, National Honor Society, the Red Cross Club, a mentorship with Meharry Medical College, and a shadow program with Nashville General Hospital. Brooke will attend Tennessee Tech University in the fall. Congratulations to Brooke and to all of the 2014 graduates! For information about the 2015 Servant Leader Scholarship, please click here.